Osteoporosis weakens bones and can lead to pain, fracture, and a decline in overall health. 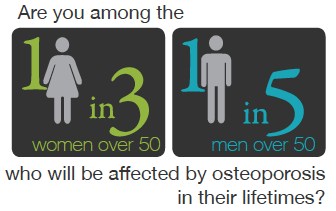 The number of people who will be affected by osteoporosis in their lifetimes may be surprising to you. But these numbers seem even higher when you consider that osteoporosis can be detected early, it can be treated, and in many cases it can be prevented — avoiding the risk of weakened bones and debilitation. Prevalent – you or a loved one may be at risk – 1 in 3 women and 1 in 5 men over 50 are! Many people are not aware of the importance of osteoporosis screening and preventive measures that can be taken. To learn more about your risk of osteoporosis, take this one-minute test. If you would like to learn more about osteoporosis screening and other health screening resources available at UCSF Imaging, please join our email list. UCSF researchers and physicians are among the world’s leaders in bone health.